Being cheated on was a terrible experience yet it catapulted me to the most amazing journey in finding and exploring my empowered self. I have heard many many success stories of men cheat one time feel awful change and grow even closer to their partner that’s not who this post is about. It’s for the ones that felt stuck like me. Most of my blog followers know my past but I will give a short version of what I thought was a normal relationship… I was in a one sided relationship with a man for roughly 9 years. I was young dumb and very rebellious when it started. I then got sucked in by the attention and smoothness that he possessed. I’m not sure when I realized I was being actively cheated on but I do know I made the choice to stay and I made the choice to believe everything he said even after I had proof that I saw with my own two eyes. 90% of the time I blamed the other woman what an idiot. The other 10% I was trying to figure out what I could do better or what I did wrong. I know hello INSANE !! hindsight is always 20/20 remember that before you judge the choices I made. I can’t even explain to you what efforts he went to to “prove” how much he loved me !!! It was all fake and a plan he was fulfilling to get what he wanted. There were years that he was in prison and I stayed and he wrote and wrote and had me convinced he would change if you read them you would even be fooled. My relationship got to the point where he could tell me my apple was purple and I would believe it. I did the whole sneeking through his phone, following him, etc… you name it I did it and looked crazy in the process. When did I wake up ? The day our daughter was born something changed inside me I felt like I didn’t even know me but I knew I didn’t want my daughter around any mess no matter what. My daughter is now 4 will be 5 in October and her dad is the man I married when she was two she knows no different. She will one day and will totally let her decide what to do with that information but in my heart I didn’t want that influence on her at all and if she resents me for that when she is older I will be okay with the decisions I made. I stayed in a cheating relationship trying to fix it and him I couldn’t even leave my door open for something amazing !!! I thank God every single day I had my daughter and was able to move on and heal. I would have never met the amazing man that’s my husband he is so good to us I knew he was my soul mate the day I met him in his eyes me and the kids are his life. And we trust each other and that feeling is the best thing that’s happened to me. You don’t need proof that your partner is cheating to know that something isn’t working between the two of you. Whether he’s actually charting or your just extremely paranoid, evidence isn’t required to know something has to change. Driving yourself insane trying to catch him in the act of cheating won’t deliver the peace of mind your looking for. It will only make you feel and look crazy. It’s a proven tested fact that… men cheat because they are cheaters when a man cheats it’s not because he was seduced by another woman’s wicked charms. It’s not because she offered something you didn’t. It’s not because she’s better than you. 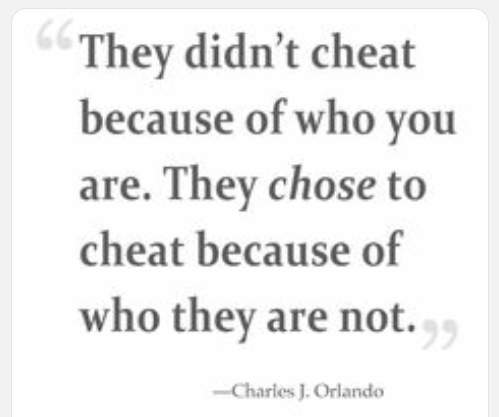 Cheaters cheat. They don’t need temptation it’s what they do. If you are involved with a weak man, you will always end up sharing him. Beat up one girl, another one will be texting him next week. Cuss out two women online, they’ll be back in his inbox next month – He is the problem not the other women. You can’t spend your life trying to guard against what might happen when he’s left alone. How do you compete with other women ? You find a man strong enough not to make them your competition in the 1st place. I was the other woman even though I went to all family functions, he “stayed” @ MY house, we were always in public together etc… I had no more perks than the ones that got him while I was at work we were all on the same level. That’s what people have to realize I always thought I was better I wasn’t we were all the same no matter how you look at it if he cheats there is NO MAIN GIRL !!!! I am so glad I got cheated on or I wouldn’t be happy today. I've been in a relationship with a cheater, and is no fun. I stayed a long time in that marriage, and God finally set me free from it. Now, I am in a happy relationship with a wonderful man. I don't regret staying when I stayed because God's timing worked everything out for me. I am so glad !! Good for you so many ppl stay and now its so awful looking in on what i used to deal with daily.